In the world of simple recipes, today’s is about as short as they come. With only 4 ingredients and very simple prep, you can have a tasty pizza over the fire that allows everyone to create their own taste. Possibly mankind’s greatest invention, outside of sliced bread, pizza ranks as one of the most consumed foods in the world. The delectable combination of melted cheese, dough, and limitless topping options make it as versatile as it is delicious. Today’s recipe is super simple and other than keeping the cheese cold easy to transport and make on the go. Any other toppings you like. I like using canned items or dried meats that require minimal handling. Place your pita bread on a hot grill until it reaches your personal level of done. I like to leave it just shy of crisp at this point so as I add the toppings and melt the cheese it doesn’t burn. I also like a little chew to the dough instead of crispy on both sides. 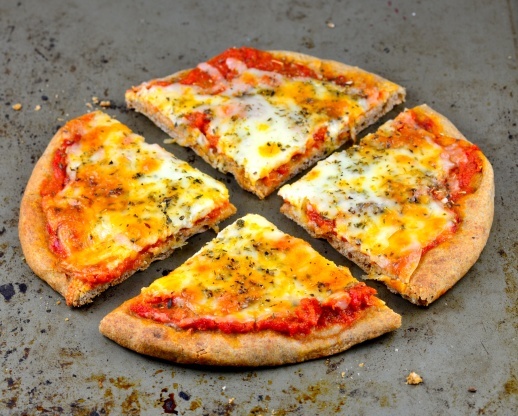 Turn the pita over, add pizza sauce, cheese and any other toppings you desire. Grill until the cheese melts. You can also place some foil over the pizza like a dome to help melt the cheese and prevent you from burning the crust. I find that on days with any kind of breeze this works much more efficiently and keeps the pizza from overcooking the crust.